Plane Parking Express is Edinburgh Airport's official Meet and Greet car parking service located within the existing Long Stay car park, so there's no time wasted searching for a space. 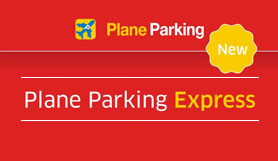 Plane Parking Express is a full Park Mark Award accredited car park, so you know your car will be safe and secure while you are away. •Once you have parked your car in the dedicated lane, you will be met by a member of the Plane Parking team who will reconfirm your return flight details and take your keys. Catch the next available bus to the Terminal. On return, take the bus back to the Long Stay Express car park from bus stop A (See Map). Alight at bus stop 4, then collect your keys from the Long Stay Express reception building.